As you can see I am totally digging the silver/gray toned room with the white furniture to contrast the walls. I also added a silver chandelier and mirror to my office/beauty room. This is why I was so inspired to write about “20 Stylish Gold Desk Accessories” last week. If you did not see that article then click here to read. I fell in love with all of the accessories I found, however I am on the fence about styling my room with gold, so I decided to seek out silver accessories this week since I received some feedback from my close friends, bloggers, and Instagram community. Thank you for your feedback!! So, with that said I am excited to share with you 20 silver desk accessories I found from my favorite online retailers. It’s one thing to hold a few magazines in an ordinary holder. It’s quite another to do so while making a major style statement. That’s what i love about the Mackenzie from Pier1 is all about. I love the texture of the hammered silver metal magazine holder. You can place this on top of your work surface or on the floor styled next to your desk. Either way will make a beautiful addition to your glamorous space. I am loving the idea of claiming your work space with a bold and shiny monogram letter. I would certainly place this on top of my favorite books or create a beautiful vignette filled with flowers and a special photo of my family. This monograms to me shows ownership of yourself and your business endeavors. How adorable are these silver heart shaped photo holders from Pier1!! You can place your favorite photos and display them proudly for all to see. Or, you can use them to place your important memos or motivating quotes. Are you a fan of Paris and the Eiffel Tower? Then why not have the view of the Eiffel Tower on your desk to view every day? Well, until you make the splurge to travel there. You can place this on your desktop and surround it with your Parisian-themed collection of French-inspired books by your favorite French designers like Coco Chanel or Christian Dior. May you be thinking a bejeweled jewelry box? Yes!! Instead of storing your pencils and office supplies inside of a boring pencil box, a jewelry box would be much more glamorous. Just imagine opening up this box and finding your sparkly silver pen or magnets for your vision board. A woman’s dream of feeling luxurious. Light up your home decor with a speckled silver mercury glass table lamp from Kirkland’s. I am enjoying the speckled finish on this lamp, for it brings a unique style to your living space! This will definitely catch the eye of any guests that visit your space. I don’t know about you, but I love the hammered steel accessories this season and to have it in a vase form is just fabulous! This texture vase by Threshold is perfect for holding long-stemmed flowers on your desk. I can imagine seeing white tulips or even hot pink roses in this lovely. Create an attractive display on your desk or a bookcase with this set of decorative spheres. These will add an element of interest to your desk. Place your favorite books between these cute elephant bookends to create a charming display. I can see these bookends styled on my desk with my favorite books such as The Magnolia Story, Elements of Style and other favorites. This fabulous hammered vase is stunning as an accent piece alone or used as a traditional vase. Highly polished on the outside, this beaded masterpiece can be filled with water and is suitable for use with a flower bouquet, potted plant, or dried arrangement. As pretty as it is practical, the vase doubles as a decorative desk accessory for holding keys, pens, and coins. Why not continue the hammered metal trend with this set of candle holders. Like I mentioned in my gold accessories post, candles are a great way to introduce a calm and soothing environment for a productive day. Needless to say, these would be a perfect addition to any office. Every office calls for a trinket tray that is beautiful and functional for tossing keys, bracelets and other office supplies into. I love how smooth and modern this tray looks and would be a match made in heaven for a modern home office. This is a must-have in any home office. I am sure many of you have important files that you need to keep organized such as bills, financial planning, home improvement projects or even for your girl bosses out there business information. With that said you will love the cool steel construction of this silver mesh file holder from the container store. It’s subtle, yet aesthetically appealing, and coordinates well with other metal, accessories in your office. How clever are these magnetic tin bins with the window from the Container Store? This is a unique way to store small office accessories, and it makes for a quick way to identify the contents. The magnetic backing allows each canister to be attached to any steel surface such as a clip board or command center. Now your office would not be complete until you add this beautiful yet bold silver platinum notebook by Erin Condgren. I adore the motivational quote about the powers of inspiration!! Such a perfect tool to inspire yourself! I am all about finding inspirational quotes to place on a wall in my office. 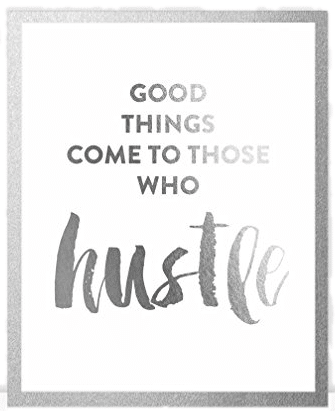 I love this “Good Things Come To Those Who Hustle.” This quote would definitely motivate me to stay on task and tackle my goals and dreams. How about you? This crystal filled pen is pretty fabulous. I would want to add this sparkly beauty to my pen collection. Not just one, but maybe a dozen. How about you? This is perfect for you girl bosses out there! Now, this elegant clear Acrylic Desk accessory enhances your desk and complements any decor. The stapler is crafted from heavy cast polished acrylic for both style and durability. Simply Elegant! It holds a full strip of standard staples and has non-skid feet. Another beautiful addition is this decorative silver picture frame with a gorgeous interlocking ring design. This metal frame has a rich and lustrous perfect for placing a photo of your loved ones inside. Every desk calls for a clock that helps with holding you accountable for your tasks and time during the work day. This tarnished silver clock is a simple and stylish enough to fit the silver accessory decor in your home office. I hope that you all found this post helpful and inspirational if you are looking to refresh or makeover your home office. Make sure you find pieces that make you happy and ready to have a productive day in your new space. I cannot wait to shop for accessories for my home office. However, I am torn, based on the design board I posted on top, on which type of accessories should I use in my space? Gold or Silver? Please let me know my leaving me a comment below. Until then, have a great day and happy accessorizing! !